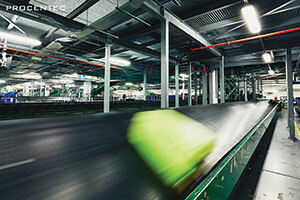 After dropping off the luggage, it gets transferred on conveyer belts to the right terminal. As they get transported, robots pick out the luggage from the belt to move them to the allocated destination, to make sure they reach the correct plane in time and eventually back to you. With the high pressure and responsibility of all the personal belongings, airports try to avoid situations in which these conveyor belts stop working. Imagine the consequences of an airport with non-functioning conveyor belts: all luggage will remain on the belt not reaching the plane on time, which also means that you will not have your possessions when you reach your destination. Additionally, airlines will be delayed, which will cause a packed airport with frustrated travellers, who will spend their time waiting instead of relaxing on the beach. To avoid this exact scenario, an airport in the UK has contacted PROCENTEC in the hope of finding a solution. A reason for a stop in the conveyor belts and thus to the entire airport procedures can be caused by a fault in the network system. The luggage system the airport uses, which includes the scanning and moving of the suitcases, works on a mixed architecture of PROFIBUS and PROFINET, two very common industrial protocols. In the past years, the airport has been using the PROCENTEC ProfiTrace to diagnose their network, which means they are familiar with the PROCENTEC and the ProfiCore, which allows diagnostics on any PROFIBUS DP and PA network. Through the growth of the airport and the industry pushing PROFINET into the market, the UK airport started to use PROFINET. Despite the fact that PROFINET only covers a small part of their network, they now have to deal with a mixed network architecture, which makes it that more difficult to maintain and monitor. As a result, they contacted PROCENTEC for a solution that could diagnose their new network with an easy to use interface: a simple “click and do report”. A solution that would not require a lot of technical knowledge and can be understood by anyone to quickly resolve network issues in order to prevent costly downtime of the luggage system. In response to their question, PROCENTEC provided their newest solution: the PROCENTEC Mercury, along with the Commissioning Wizard, that offers automated commissioning of PROFINET and Industrial Ethernet networks. PROCENTEC Mercury is the latest diagnostics solution for such scenarios. It is a rugged mobile solution that allows you to run multi-protocol diagnostics for all environments. 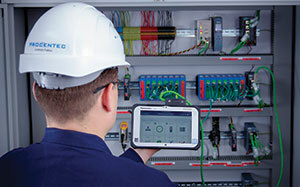 The PROCENTEC Mercury is perfect for troubleshooting, maintenance and monitoring Industrial Ethernet and PROFIBUS networks. It not only enables the user to gain insight in to the health and possible faults in the network, but also automates commissioning for PROFINET and Industrial Ethernet networks, with the Commissioning Wizard. During the development, the user was and remains, the focus. To keep this promise, PROCENTEC consulted users, with the objective to develop a product that fulfils their needs. As a result, the device offers remote and wireless connection, mobility and an easy to use interface for everyone to use. It also includes the PROCENTEC Delphi, your Virtual Network Engineer that holds 20 years of knowledge, assisting the user on every step. With the mixed architecture the UK airport is dealing with, PROCENTEC has not only provided a mobile and easy-to-use solution for the current situation, but also prepared them for the future, as the PROCENTEC Mercury enables them to run diagnostics, detect faults and as a result prevent potential downtime. This entry was posted in News and tagged IT, Software. Bookmark the permalink.